Label templates let you set up standard layouts for things like spine or barcode labels. After creating templates, you can export a PDF based on a template that contains the label data for your resources. For example, you may run a resource batch where you change the home library of several hundred books; you can then print labels for all those resources based on one of your templates. Read about how to print library labels. Go to Library > Settings > Label Templates. Click Add a Label Template. Give the label a name—Avery 5260 or Dymo 30347 or CD/DVD, for example. These dimensions determine where your printer will lay down the ink. Say you got rid of that half-inch left margin: every label you print onto an Avery 5260 sheet would be positioned a half-inch off. Label fields are the blocks of resource information included on each label. These items have to be arranged so that they fit on one, single printed label. The first thing to do with a label template is to edit the page layout dimensions. Enter or edit values for the fields you need to change. 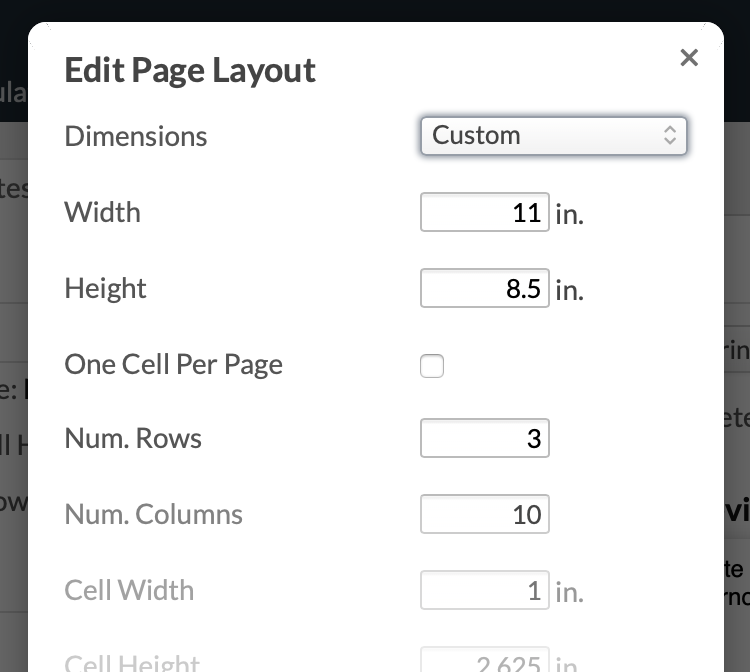 The cell width and height determine the overall dimensions you'll be using for your label fields. If this is a template for a roll of labels, make sure to check one cell per page (leave unchecked if this is a sheet of labels). Label fields let you specify the label's content and appearance. Choose whether this is a Text or Barcode field. You can only have one barcode field per label template. Enter your content. 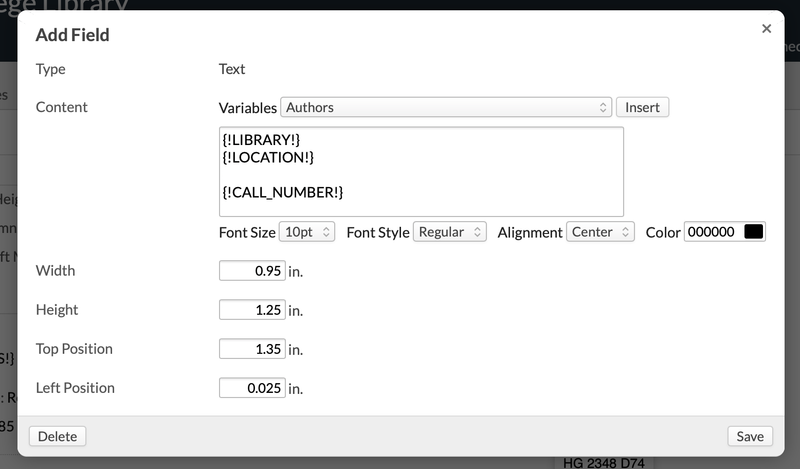 You can include variables like author name, title, etc. You can also type text. Format the content with font size, color, and alignment. Top: Your first label field should probably be at 0 inches; subsequent fields should take into account the height(s) of the previous fields. A good rule of thumb: add the height and position top of the previous field(s) to get the minimum position top for your new field. You'll see the field in the preview in the right column of the screen. If you need to adjust a field, hover over it and when you see the blue highlight, click it. As you save your label fields, you'll see a preview in the right column. Provided your monitor is not set up with some strange configuration, the preview is roughly the size of the actual printed label. The preview will help you make tweaks and adjustments to your label fields and their positions relative to one another. Click Print Preview to test your label template with random selections from your catalog. Clone label lets you create a new label template based on the one you're working with. Next steps: enable Library and get acquainted with all its functions.